Satori and I have been busy. We’ve worked hard at learning how to sail, what to repair, and how to sail in the Ocean. After wintering over in the San Juan Islands, mostly living on the hook, and spending time sailing around the Salish, I feel fortunate. Since I was young I have always thought about sailing in the ocean. I knew it would feel different than sailing close to land. Also the boat would be different, and look out of place in the protected waters of the sea. 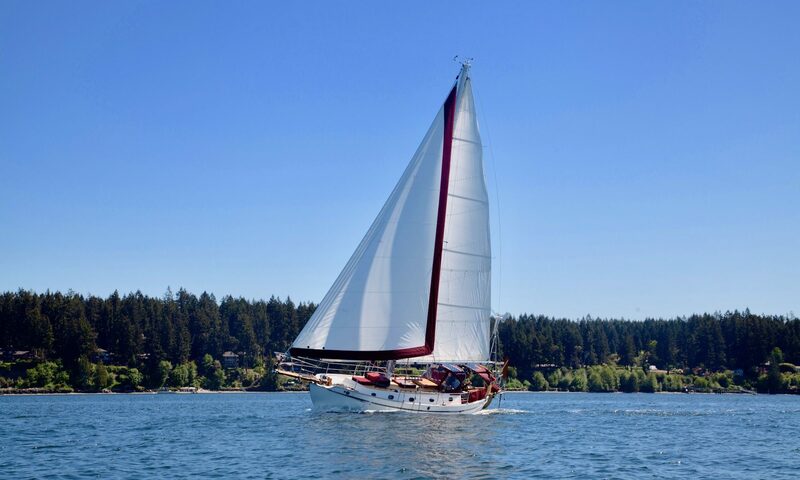 When my longtime family friend offered a good deal on Satori, I felt it was my purpose to take her and sail her like she was meant to do. In a way, I think maybe she chose me. Maybe she knew I would take her to the ocean, and she would show me what that means. After three years we finally did it. We made it to California. During the months of April, May, and June I spent most of my time in Port Townsend. Either I was working on Satori, or playing music with the locals. There was still much to do to get Satori ready for her trip down the coast. I worked with the local maritime tradesmen, mainly shipwrights, to finish the job. 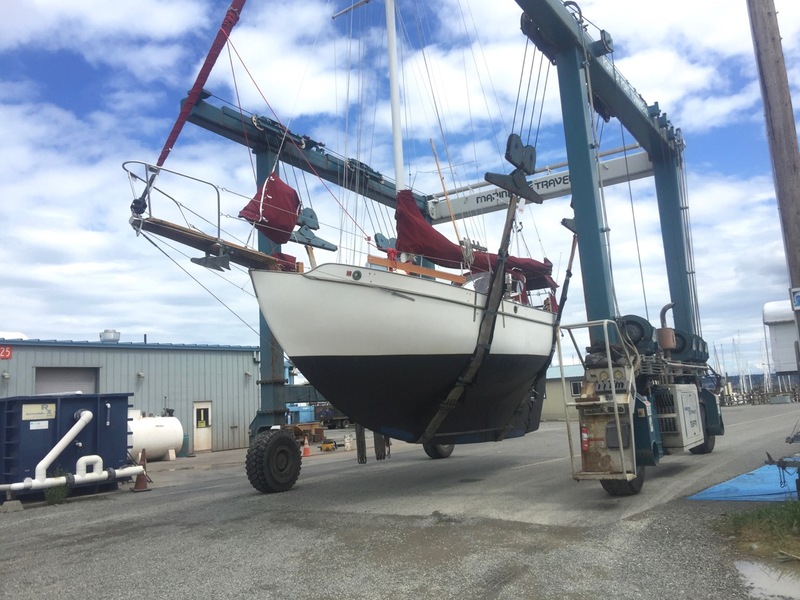 Her prop needed overhauling, her bottom faired, her rigging completed, her water tanks water tight, her rudder overhauled, her tiller repaired, and her cabin organized. By the end of June most of the tasks had been completed. I’d work in the evenings and weekends while the painters worked on her hull, or the prop guy pecked away at getting parts and installing them. Eventually everything was completed that needed to be done before she went back in the water. 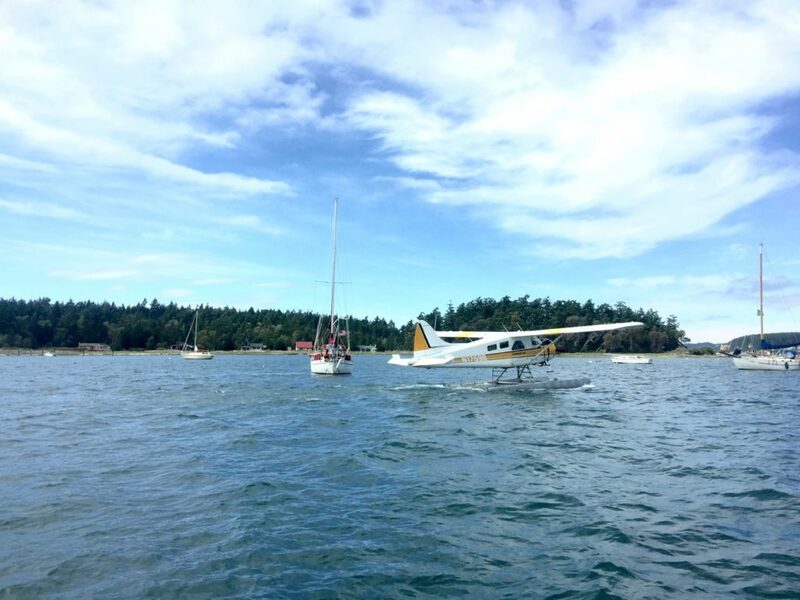 I decided to take a trip into the San Juan Islands to visit some of the sailing community, some which I had met already, and others only through social media via the internet. A few days in Fishermans Bay on Lopez Island, then back to Seattle to wrap up the final provisions of food and supplies. I rounded up my first crew member, then we began our journey back north to pick up another and head out into the Strait one last time. 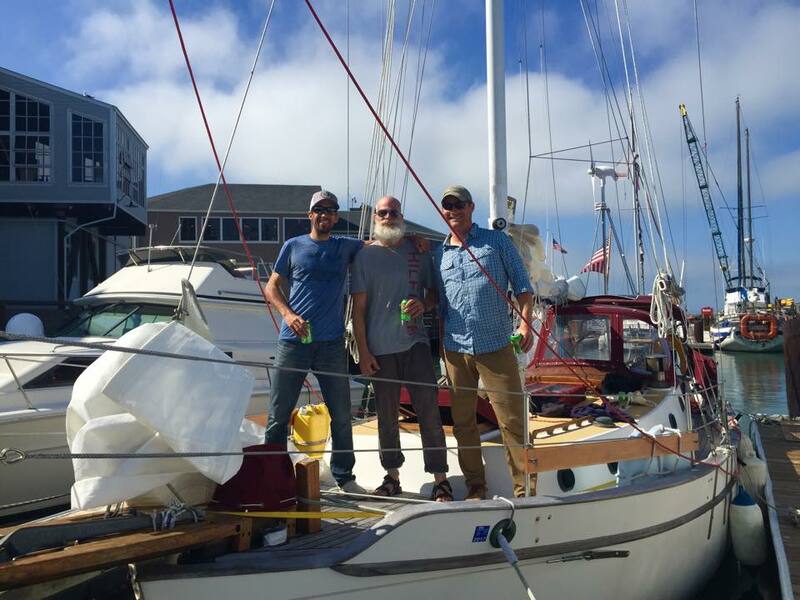 Our first stop was in Port Townsend to pick up the second crew member, and to top off the water and fuel, plus fill the two jerry cans of water, and two of diesel. We also decided to prepare Satori to be more water tight. First by moving the anchor chain into it’s storage under the v-berth, and then sealing the chain pipe with a towel, a plastic bag, some duct tape, and more duct tape. We also sealed the jerry can lids with plastic bags and duct tape in case the seal was not secure. Finally I lashed the anchor to keep it from moving, and sealed the second chain pipe. I secured the wires in the engine compartment to prevent any movement, as well as added a little more security to keep the battery bank from moving. Finally I bolted the cockpit sole and sealed it to prevent water from leaking through in case the cockpit filled with seawater. 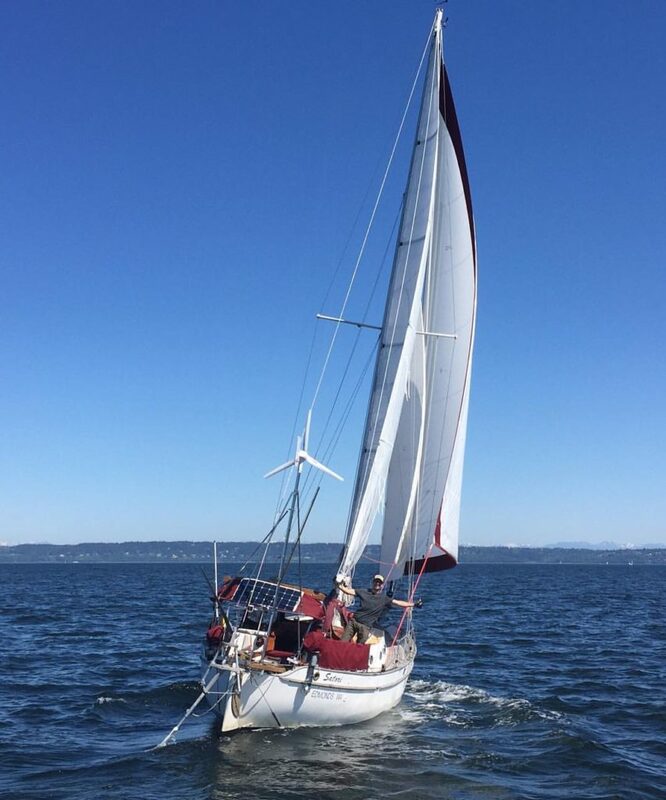 We also did some additional tweaking to the running rigging so we could barber haul the jib or staysail, plus added a boom preventer so we could vang the boom outboard, plus run a preventer system from the bow back into the cockpit. This allowed anyone at the helm to release both the vang and preventer without going forward, in case there was a sudden need to jibe or sheet in the boom. I moved the boathook down into the cabin and secured it to the headliner to keep it out of the way. The trysail slugs were in the second track, and the sail stowed in the ready bag under the boom. Everything seemed to be in it’s place, crew ready with their tethers and hunger for blue water, and then we headed out into the Strait. The trip from Port Townsend out was supposed to be nonstop, out the gate, and down the coast. Conditions were not ideal, but then again, they never seemed to be right. We pressed on and motored past Port Angeles. Eventually we encountered twenty-five knot headwinds, with gusts to thirty. 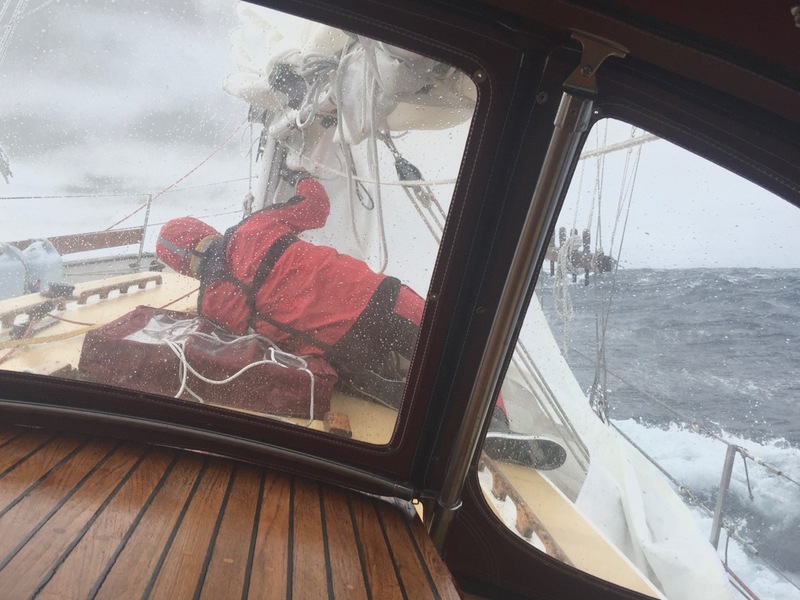 The waves stacked up, our progress slowed, a crew member seasick, then fell during a lurch and sat on a protrusion in the cockpit which caused a nasty bruise. Our speed slowed to about two knots, and our chance of getting to Cape Flattery on time seemed low, so we opted to spend the night back in Port Angeles. A couple of hours of downwind sailing under staysail put us easily into the harbor. We spent the night there, then looked at the weather forecast again. This time we saw a better weather window just a little further out. Instead of departing on Thursday, we chose Sunday morning. We just needed to be at Neah Bay by Saturday night, and bought even more time to mentally prepare. 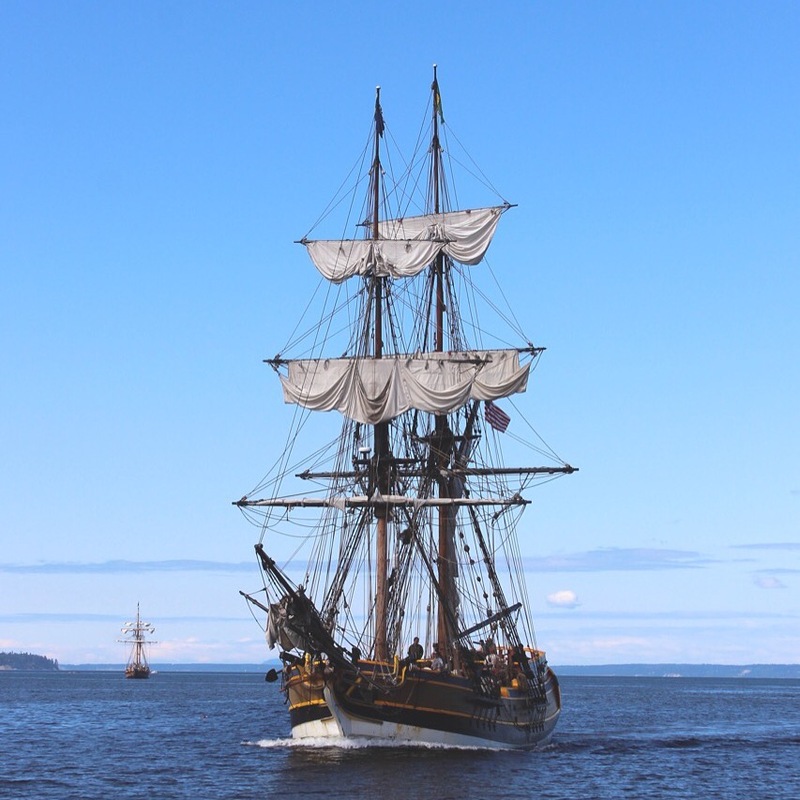 The next day we motored to Neah in calm seas and winds, and made great time getting into the harbor. We spent a few days doing even more tweaks to the rigging, and preparing. Mostly we just tried to relax, and enjoy the solitude of the land of the “fat belly”, or “the generous with food” – aka Makah. The forecast looked okay for the first few days, but pretty rough at Mendocino. In theory we could head offshore, stay further off at Mendocino, then head back in once we were clear of the heavy weather. Winds did not look light, but we decided to go and just try to avoid gales. Sunday morning we were all up bright and early. We departed the calm and foggy bay at 7:30 am, and were out into the strait by 9am. The swell was stacked up again, and winds combined with the steep waves were up enough to cause a crew member to become seasick. 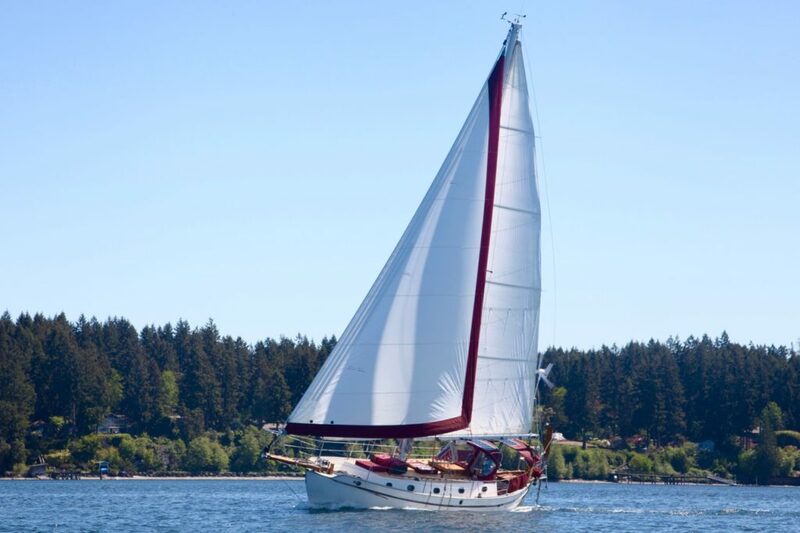 Satori did great breaking through the swell and getting past Tatoosh Island. Eventually we could stop motoring, the swell became westerly, and the winds back from the northwest. By mid-afternoon we had all sails flying with a double-reefed mainsail. We remained on the same tack through the night, and when the winds built to over twenty knots, we furled the jib and ran under double reefed mainsail and staysail. The next day I also had been stricken with seasickness. The entire day I could not keep anything down, but by the evening it eventually subsided. My body adapted to the motion, and I eventually felt better again for the remainder of the trip. 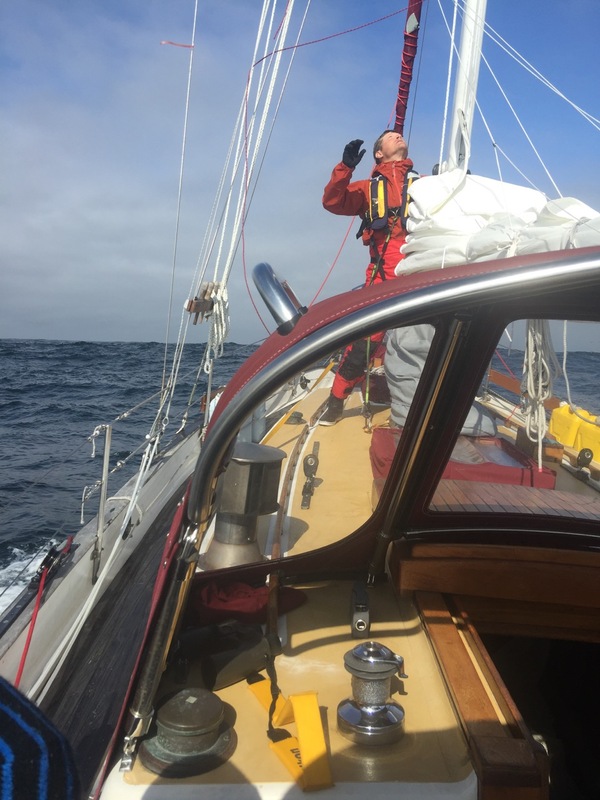 Our tack was pushing us offshore quite a ways, and we needed to keep close enough to land so that once we were at Mendocino we were close to the mark that we used to get around the heavy weather. The forecast called for gales near shore, and offshore. We had no place to go so we buckled down and accepted our fate. On the fourth day we jibed and headed back towards shore with only the jib. We were hitting speeds of six and seven knots the entire way. We worked to keep Satori under six knots, but suffered the boat rolling. By the fourth night, the winds had built and the seas seemed to be building as well. For the entire evening I watched the seas continue to build. Water started to break high enough to flush across the deck. On occasion the water would enter the cockpit. I stayed up the entire night studying the ocean and learning the waves. I learned about the intervals, the breaking seas, the swell, and grew confident that we could overcome whatever come to us. The next morning we decided to head back offshore. This time we would line it up with our mark at Mendocino. 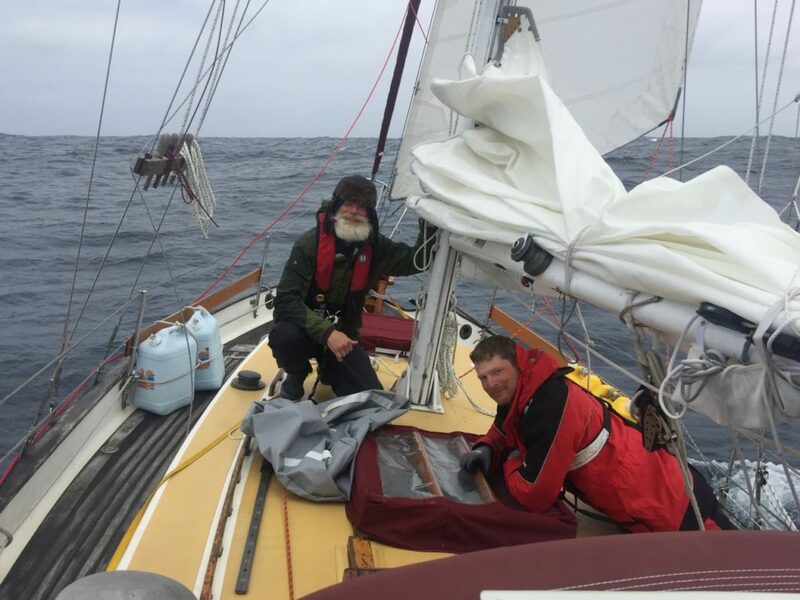 As the winds and waves continued to build, we opted for a sail change to staysail only. By the fifth day we were in gale force winds, and waves bigger than any had ever seen before. At one point we all realized that the only way out of our situation was to keep pressing on. Somewhere a little north and a hundred miles from Mendocino we decided that the boarding seas were getting out of hand. The Aries wind vane autopilot could not keep her on course. At first we tried to heave-to. I had never tried it with the storm sails, and although we did get a slick for a short period, she eventually gained headway. 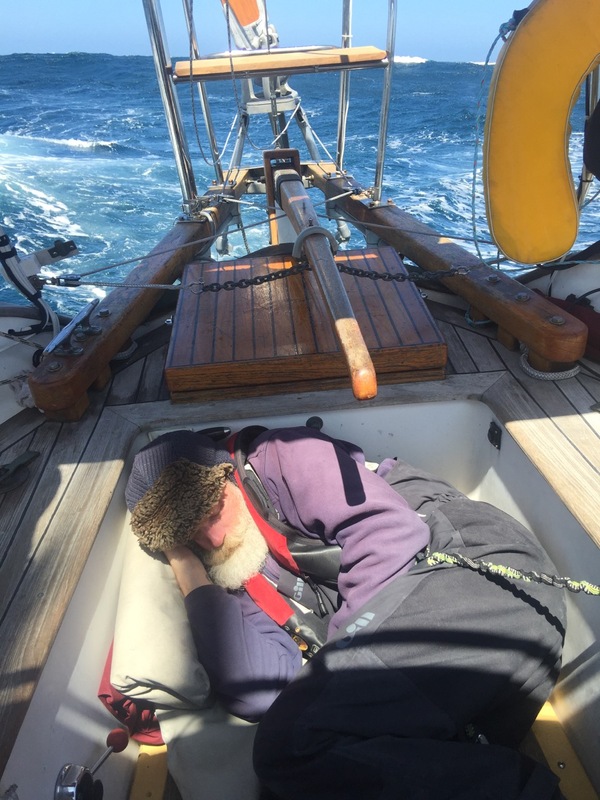 The crew was very tired from the sail change, and the effort involved, so instead of continuing on getting her to heave-to, we took a break and continued sailing. I went below to take a quick nap, but within forty-five minutes was awoken when a crew member yelled down to get suited and help out. The wind vane could not steer Satori any longer, so we switched to hand steering. Fortunately I had been in a similar situation in the Strait of Juan de Fuca, where the seas were stacked and the waves were breaking. Only this time the swell height was three or four times bigger. I taught the helmsman how to keep the stern to the waves and allow the water to wash under the boat. Every time a wave came, we would instruct the helmsman how far centered, or to port/starboard the bow should be for the oncoming wave. He would correct and keep her pointed, but sometimes Satori lost her steerage from waves that broke big enough to have a slick of turbulence. Only a few times did the slick prevent us from being setup for the next wave. We were never told about Mendocino Ridge, and with the combination of gale force winds, and the upwelling from the bottom of the ocean, we had massive waves to contend with. To describe such a thing will never compare to what it was like in person. I will try by explaining the size of waves. Behind us looked to be waves the size of boxcars on a train, with an occasional wave that was almost twice the size. Most of them broke from the gale force winds that blew their tops off. When they broke from underneath Satori we could see the trough, which looked to be like looking down from the height of a boxcar. More or less 15′, but 40′ in length from the top of the wave to the bottom, and occasionally 60′ from a big wave. Fortunately it only lasted for about four hours, but during that time we took on considerable water, the wind turbine died, and our spirits were pretty low. By the evening we were able to give the helm completely back to the wind vane, but we kept a watch schedule to make sure we didn’t encounter any more big waves capable of knocking Satori sideways down a wave. A couple of times during the night she did hit a wave sideways, but she would always recover and get back on course. It was a rough night, but we endured, and Satori kept us warm and dry. The next morning was concerning for us. We had jibed again to head back towards land, but were quite a ways offshore. To make a landfall in San Francisco, we needed to be further on our beam, but the swell and breaking seas were still threatening us. The forecast showed to be less severe than before, so we waited, then we decided to try a beam reach. At first it seemed like a bad idea, but after the first hour the winds and seas subsided enough to make the sail enjoyable. We were screaming at seven knots over water and headed straight into land. We continued this course with minimal boarding waves until our course was close enough in to allow us to bear away again and head towards the Bay. 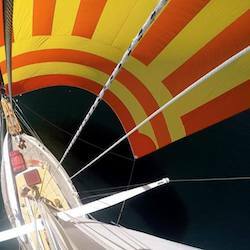 By nightfall we were running under staysail and double-reefed mainsail alone, and going faster than I had ever thought Satori could go. At times in the evening I saw nine knots over water, and over ten knots over ground. I was back to panic mode, being concerned that the winds would build and Satori would experience her first broach. I opted to suit up and drop the mainsail to slow her speed for our night run. Eventually the winds did build again, but not enough to cause boarding waves except a few times from the rolling motion. By morning we were close enough into Point Reyes to begin motoring so we could time the Golden Gate tides. The seas were still up, but the tiller pilot did well at keeping her on course. Although we were not through the gate yet, our spirits were high, and we knew by the afternoon that we would step off the boat and onto land again. The first ten hours of motoring was uneventful. The anticipation had built, and everyone was wide awake and excited for our landfall. We had done it. 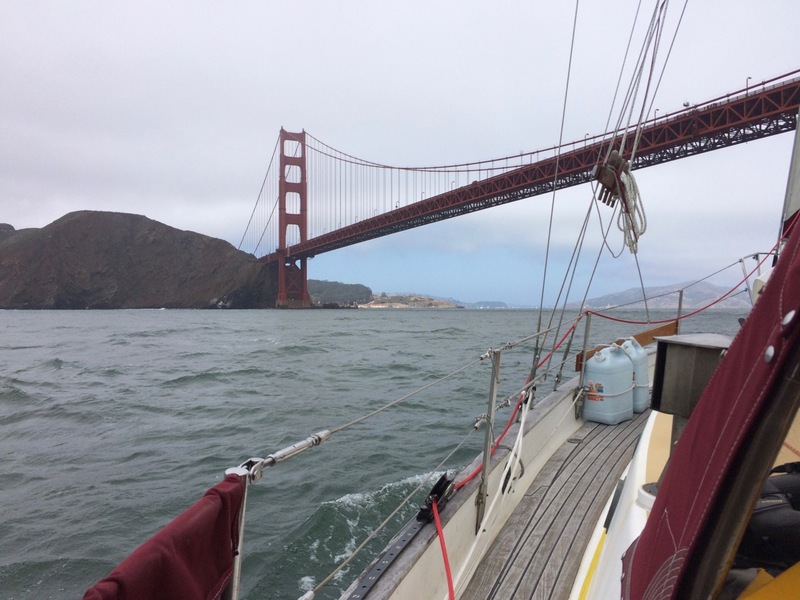 By the time we entered Golden Gate, the tides were still at flood, and the winds had picked up enough for us to sail under the bridge. A friend allowed us to use his slip at Pier 39, so once in alignment with Alcatraz, we switched the motor on and entered the harbor. We had done it, averaging 135 nautical miles per day, over the course of six days and seven days total. Satori and her crew had not only sailed through gales, but we learned how we could have done it better. I realized that the trysail was not used nearly enough during the trip. Running under staysail alone caused Satori to roll more than she needed. With the addition of the trysail in winds above twenty-five knots would keep her stable and allow her to stay upright. 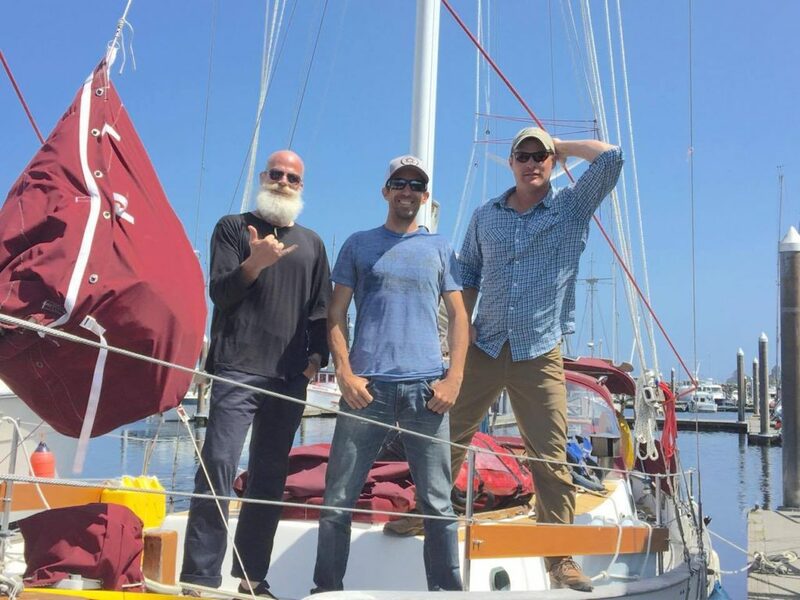 I was fortunate to have a competent crew, even if we were all only experienced at sailing in the protected waters of the Salish Sea. They will return knowing that anything they encounter there will never compare to the unforgiving Mendocino Ridge and Northeastern Pacific Ocean. A few shouts to those who helped me make it happen. First I want to thank my mom, who gave me rides to Port Townsend after ditching my car, and rides to Costco to provision for the trip. She was also who mentioned Mendocino Ridge in a text message, which eased our stress knowing that it would eventually end once the sea floor went back down again. She also sent daily emails with NOAA forecast reports for the California coast and offshore areas. They were very helpful, in addition to PredictWind Offshore app and grib downloads. Also my friend Marvin, who’s wisdom and thoughtfulness was forever helpful. He was our point of contact for the float plan, and for daily messages via Iridium Go! sat phone. To Frank Schattauer, who I worked with on getting Satori’s offshore sail plan and suite of sails for bluewater sailing. He and his brother Axel not only built an amazing set of sails that performed flawlessly, but was helpful in configuring the running rigging on Satori. His advice added safety and simplicity in reefing, and running the staysail without a boom, plus helping me decide to go with a roller furling jib. Two generations of sailmaking and sailing experience has led to giving great performance to a boat known for lack of speed. Also to Randy Leasure for loaning me his slip at Pier 39. After spending two weeks getting to San Francisco, and having a slip right in the heart of the city, with friendly staff and tenants, I feel blessed. His passion for sailing has been an inspiration since I first started doing research on how to sail a Westsail in modern times. There are others who have helped along to way. My friend and crewman Jason, who is a phenomenal sailor and sail trimmer. He has helped me maximize Satori’s sail plan, and keep her moving along as fast as she can safely go. When I was most concerned, he did great keeping me calm. His background in aviation has given me new light on maximizing the performance of a cutter rigged sail plan. And to my crewman Mike, who I couldn’t have had a better person to compliment Satori, Jason, and myself. He stepped up for his watches, slept on the floor, and took a beating, then went home wanting more. He is an inspiration on living life. After a lifetime of dreaming about ocean sailing, and three years of outfitting Satori for the trip, and a rollercoaster of emotion, we’re here. I’ll be updating the blog going forward to keep you up to date on where we are at. I’m working my way down the coast to warmer weather. We have achieved eleven latitudes south, and have five more to go before fall. Stay tuned for more adventures.